Jingle Bells, Jingle Bells, Jingle All The Way…. (record scratch)…….Your cell phone rings, just received a showing request for December 23. Is your house staged and ready to show this holiday season? There is much debate about whether you should list your house during the holiday months. The Ask Cathy Marketing Group of Keller Williams says, “Absolutely you should list during winter! You will find buyers during this time of year are the most motivated buyers you will encounter. In fact, according to CNBC and Bankrate, winter is one of the best times of the year to buy a home. Keep it Clean– Deep clean your house to declutter, minimize and depersonalize. Dust, clean, wipe, spray, mop, and most importantly DECLUTTER. Your buyers shouldn’t be looking at your stack of magazines in the corner. Keep it Warm and Homey– You don’t want to create a Christmas Party, but you do want to Deck the Halls. Less-is-more when staging your house even during the holidays. Decorate in a subtle way by dusting off Aunt Irene’s wooden bowl and fill it with scented pine cones, lay fragrant greenery along your mantel, and hang an inviting wreath on your front door. If it is cold outside, set your furnace to a cozy temperature so buyers are tempted to stay longer in your house. Keep it Broad– Remember you are trying to appeal to a broad range of people. Don’t get too personal or overly religious with your decorations. De-personalize your house. Take down family photos, nativity scenes, and any religious or off-putting décor. Your goal is to make everyone be able to see themselves living in your house. 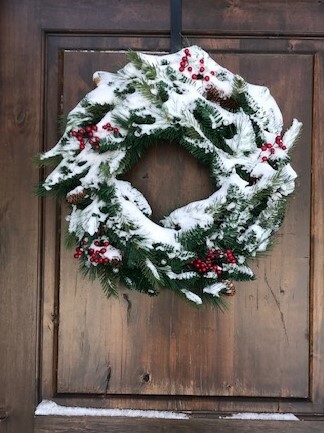 Everyone can enjoy a neutral, freshly cut wreath hanging on the door. Keep it Simple– Good news, you do not have to put out ALL your decorations this year! Don’t be scared of empty space. Remember, less-is-more. You can start your packing early by going ahead and putting your unused decorations away. Hopefully, you will be unpacking your favorite Santa Claus collection in your new house next year! Keep it Tasteful– Make sure your holiday decorations don’t clash with your daily décor; you want them to complement your house. This is where a professional stager comes in handy! You want your decorations to match your walls and furniture. If you have a lighter hue on your walls, you can use the richer, darker reds and greens to compliment the lighter colors. If you have a darker or more colorful hue on your walls, you can skip the red and green, and go with metallics like gold, silver or even white decorations. Keep it Easy to See- You want buyers to see the highlights of your house easily. Ask yourself, as you walk in your front door, what do you want buyers to see first? Now take some mistletoe or fresh greens and decorate that spot. If you have an amazing fireplace, keep it easy to see and don’t cover it up with decorations. If you have an amazing two-story house with a beautiful staircase, loosely wrap a simple green garland along the banister. If it is your kitchen you want to highlight, then empty the counters (completely) and place Aunt Irene’s bowl filled with scented pine cones on the counter to invite buyers in. Keep Lights Simple– This year, take a break from entering into the Greatest Holiday Light Display. Again, this is a great time to start packing away your inflatable reindeer sleigh and blow-up Frosty with the blinking hat. If you decided to put lights up this year, keep it to a simple string of lights- yes, only ONE. Next year at your new house, you will for sure be rested and ready to knock the socks off your new neighbors with your display. Keep it Safe Outside– In the winter months, curb appeal may not seem as important, but it is! If the weather is questionable, make sure driveways are shoveled and de-iced. Stock up now on de-icer and a good snow shovel to make shoveling easier. If buyers pull up to your house and have to walk through snow to get to the front door, they may not get out of the car. Place a basket with towels or shoe covers by the front door so buyers won’t get your floors wet and dirty while they walk through your house. This is important if you have a number of showings in one day. You may not have time between showings to make sure your floors stay clean. Keep the Tree or Menorah, if you must– If you find you cannot live without your tree or menorah this year- Go small and portable. Buy a small tree you can easily put way during showings. You can put a small tree on a table and when the showing request comes in, you can simply put your tree away in a closet or basement. For the menorah, you can create one by placing eight votives and one pillar candle on tray filled with greens, flowers or even large pebbles or rocks to match your house décor. Or you can do the same concept as the smaller tree. Simply put your Menorah away during showings.